Guide to developing authentication nodes for use in ForgeRock® Access Management (AM) authentication trees. AM provides authentication, authorization, entitlement, and federation software. This guide provides guidance and best practice for developing and maintaining authentication nodes in AM. For information on configuring and using authentication trees, see "About Authentication Trees" in the Authentication and Single Sign-On Guide. Authentication trees (also referred to as Intelligent Authentication) provide fine-grained authentication by allowing multiple paths and decision points throughout the authentication flow. Authentication trees are made up of authentication nodes, which define actions taken during authentication, similar to authentication modules within chains. Nodes are designed to be single-responsibility, and where appropriate should be loosely coupled to other nodes, enabling reuse in multiple situations. For example, if a newly written node requires a username value, it should not collect it itself, but rely on another node, namely the Username Collector Node. This section covers the two most common types of authentication node. Collector nodes capture data from a user during the authentication process. This data is often captured by a callback that is rendered in the UI as a text field, drop-down list, or other form component. Examples of collector nodes includes the Username Collector Node and Password Collector Node. Collector nodes may perform some basic processing of the collected data before making it available to subsequent nodes in the authentication tree. 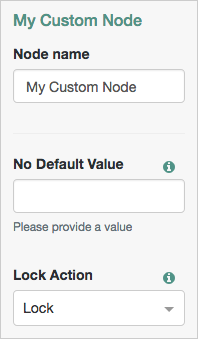 The Choice Collector Node provides a drop-down list populated with options defined when the tree is created, or edited. Not all collector nodes use callbacks. For example, the Zero Page Login Collector Node retrieves a username and password value from the request headers, if present. Decision nodes retrieve the state produced by one or more nodes, perform some processing on it, optionally store some derived information in the shared state, and provide one or more outcomes depending on the result. The simplest decision node returns a boolean outcome - true, or false. Complex nodes may have additional outcomes. For example the LDAP Decision Node offers additional outcomes of Locked and Expired. The tree administrator decides what to do with each outcome; for example the True outcome is often routed to a Success node, or to additional nodes for further authentication. In the following example tree, two collector nodes are connected before a Data Store Decision Node. The node then uses the credentials to authenticate the user against the identity stores configured for the realm. In this instance, an unsuccessful login attempt leads directly to failure; the user must restart the process from scratch. A more user-friendly approach might route unsuccessful attempts to a Retry Limit Decision Node. In the following example, unsuccessful authentication attempts at the Data Store Decision Node stage are routed into a Retry Limit Decision Node. Depending on how many retries have been configured, the node either retries or rejects the new login attempt. Rejected attempts lead to a locked account. Some Decision Nodes are only applicable when used in conjunction with other nodes. For example, the Persistent Cookie Decision Node looks for a persistent cookie that has been set in the request, typically by the Set Persistent Cookie Node. The OTP Collector Decision Node, which is both a collector and a decision node, only works when used in conjunction with a one-time password generated by a HOTP Generator Node. Authentication modules contain multiple states, with the associated inputs and outputs of each state resulting in either callbacks returned to the user, or state changes inside either AM or at a third party service. States within a module either collect input from the user or process it. For example, a module can collect the username and the password from the user and then authenticate the user against the data store. When finished, the module decides whether to return a boolean success or failure flag. The outcome of an authentication module can only be success or failure. Any branching or looping must be handled within the module. An authentication mechanism is implemented in full within a single module, rather than across multiple modules. Therefore, authentication modules can become large - handling multiple steps within the flow of an authentication journey. Authentication nodes, however, can have an arbitrary number of outcomes that do not need to represent success or failure. Branching and looping are handled by connecting nodes within the tree and are fully controlled by the tree administrator, rather than the node developer. Nodes are often considerably smaller in terms of code size, and are responsible for handling a single step within the authentication flow. For example, an individual node could capture user input, another could make a decision based on available state, and another could invoke an external API. Nodes expose this approach to the tree administrator. Unlike modules, where the journey through the module's states is defined by the module's developer, a journey through a collection of nodes may be different for each user. Node developers should be aware of the expectations for a node to deliver a limited amount of specific functionality, which tree administrators can connect together in a variety of ways. Nodes are responsible for a single step of the authentication flow. Modules are responsible for an entire authentication mechanism. Tree administrators control the branching, looping, and sequencing of steps by linking nodes together. Module developers set these state transitions within the module itself. Nodes are stateless; instances of node objects are not retained between HTTP requests, and all state captured must be saved to the authentication session's shared state. Modules store state within the module object. Node configuration is handled with annotations. Modules use XML. Nodes are easier to test due to their smaller code size and their specific functionality. The ease of transitioning from a module to a node depends on the amount of functionality provided in the module. As nodes are more fine-grained than modules, split the functionality of the module into individual nodes which can then work together to provide functionality similar to the module, but in a more flexible manner. Sends one-time passwords by using SMS messaging. Sends one-time passwords by using SMTP. Collects and verifies the one-time password. The four distinct functions are encapsulated into separate nodes, allowing greater control over the one-time password process. For example, a tree administrator who is only interested in sending one-time passwords by using SMS messages can omit the SMTP node. Separating out the decision functionality means that it can be combined with another decision node, or simply routed to an alternative authentication process. Some authentication modules delegate their functionality to utility classes in AM, which simplifies the process of creating a similarly functioning node. For example, the LDAP authentication module and LDAP Decision Node share the LDAPAuthUtils class for LDAP authentication. In cases where such utility classes do not exist, consider extracting the common functionality used by the module into such a class, so that it can be more easily used by nodes. For information on sharing configuration, see "Sharing Configuration Between Nodes". To determine the functionality of a node, it is important to reduce the responsibility to its core purpose, while ensuring it performs enough tasks to be useful as a step in an authentication journey. Before creating a set of nodes, a node developer must first understand the level of granularity they should produce. For example, a customer's environment may require a series of utility nodes which, on their own, do not perform authentication actions, but have multiple use-cases in many authentication journeys. In this case, the developer may create nodes that take values from the shared state and save it to the user's profile. Individual nodes can respond to a variety of inputs and outputs, and return different sets of callbacks to the user - similar to the state mechanism used by modules - without leaving the node. If a node's process method takes input from the user, and then immediately processes it. Consider splitting the functionality over two nodes. A collector node returns callbacks to the user, and stores the response in the shared state. A decision node uses the inputs collected so far in the tree to determine the next course of action. A node that takes input from the user and makes a decision should only be designed as a single node if there is no possible additional use for the data gathered, other than making that specific decision. If a processing stage in a node is duplicated in other nodes. In this case, take the repeating stage out and place it in its own node. Connect this node appropriately to each of the other nodes. If multiple nodes contain the same step in processing, such as returning a set of callbacks to ask the user for a set of data before processing it in different ways, the common functionality should be pulled out into its own node. If a single function within the node has obvious use-cases in other authentication journeys. In this case, the functionality should be written into a single, reusable node. For example, in multi-factor authentication, a mechanism for reporting a lost device is applicable to many node types, such as mobile push, OATH, and others. This chapter explains the prerequisites for customizing authentication nodes, and how to use a Maven archetype or the samples provided with AM to set up a project for building nodes. For information about customizing post-authentication hooks for a tree, see "Creating Post-Authentication Hooks for Trees" in the Authentication and Single Sign-On Guide. 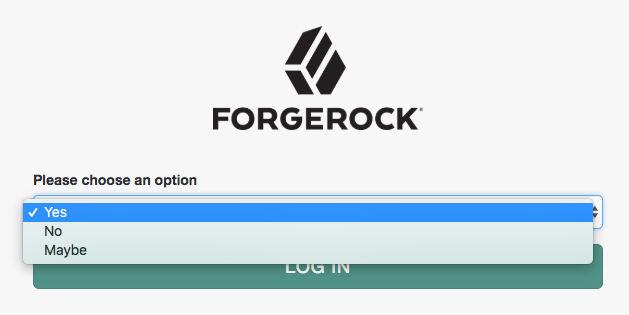 "To Prepare an Environment For Building Custom Authentication Nodes"
"To Set Up a Maven Project For Building Custom Authentication Nodes"
In a browser, navigate to the ForgeRock BackStage website and log in or register for an account. Confirm or request that your account is added to a subscription. 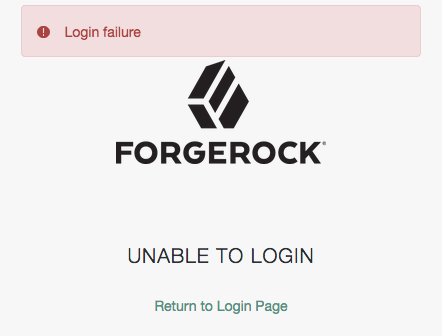 For more details, see "Getting access to product support" in the ForgeRock Knowledge Base. Install Apache Maven 3.2.5 or later, and Oracle JDK or OpenJDK 1.8.
platform encoding: UTF-8 OS name: "mac os x", version: "10.11.6", arch: "x86_64", family: "mac"
Configure Maven to be able to access the ForgeRock repositories by adding your BackStage credentials to the Maven settings.xml file. For details, see "How do I access the ForgeRock protected Maven repositories?" in the ForgeRock Knowledge Base. ForgeRock provides a Maven archetype for creating a starter project suitable for building an authentication node. You can also download the projects used to build the authentication nodes included with AM and modify those to match your requirements. Ensure you have completed the steps in "To Prepare an Environment For Building Custom Authentication Nodes" before proceeding. A domain name that you control, used for identifying the project. The name of the JAR created by the project, without version information. Also the name of the folder created to store the project. The version assigned to the project. The package name in which your custom authentication node classes are generated. The name of the custom authentication node, also used in the generated README.md file and for class file names. A new custom authentication node project is created, for example in the /Users/ForgeRock/Repositories/customAuthNode folder. 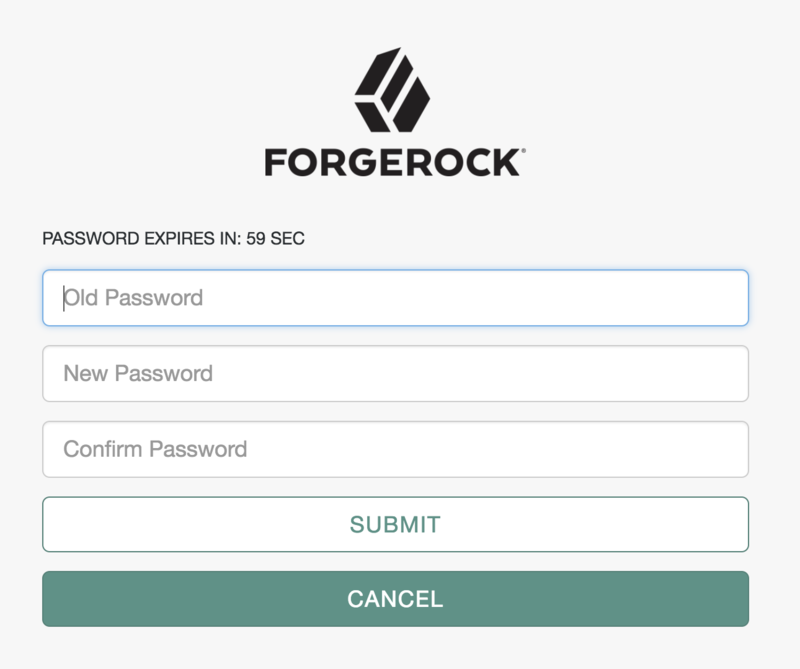 If you do not already have a ForgeRock BackStage account, get one from https://backstage.forgerock.com. You cannot clone the am-external repository without a BackStage account. URL encode your BackStage ID if it contains special characters. For example : becomes %3A and @ becomes %40. Enter your BackStage password when prompted to do so. The AM authentication nodes project is located in the am-external/openam-auth-trees/auth-nodes/ folder. Your node may be deployed into a different AM version to that which you compiled against. ForgeRock endeavours to make nodes from previous product versions binary compatible with subsequent product versions, so a node built against AM 6 APIs may be deployed in an AM 6.5 instance. Other custom nodes may depend on your node, which may be being built against a different version of the AM APIs. Other custom nodes, or AM itself, may be using the same libraries as your node, for example Guava or Apache Commons, and so on. This may cause version conflicts. Mark all ForgeRock product dependencies as provided in your build system configuration. Repackage all non-internal, non-ForgeRock dependencies inside your own .jar file. Repackaged dependencies will not clash with a different version of the same library from another source. If you are using Maven, use the maven-shade-plugin to repackage dependencies. Apache Maven project file for the custom authentication node. This file specifies how to build the custom authentication node, and also specifies its dependencies on AM components. Core class for the custom authentication node. See "The Node Class". Plugin class for the custom authentication node. See "The Plugin Class". Properties file containing the localized strings displayed by the custom authentication node. See "Internationalization". In Java terms, an authentication node is a class that implements the Node interface, org.forgerock.openam.auth.node.api.Node. The Node class may access and modify the persisted state that is shared between the nodes within a tree, and may request input by using callbacks. The class also defines the possible exit paths from the node. 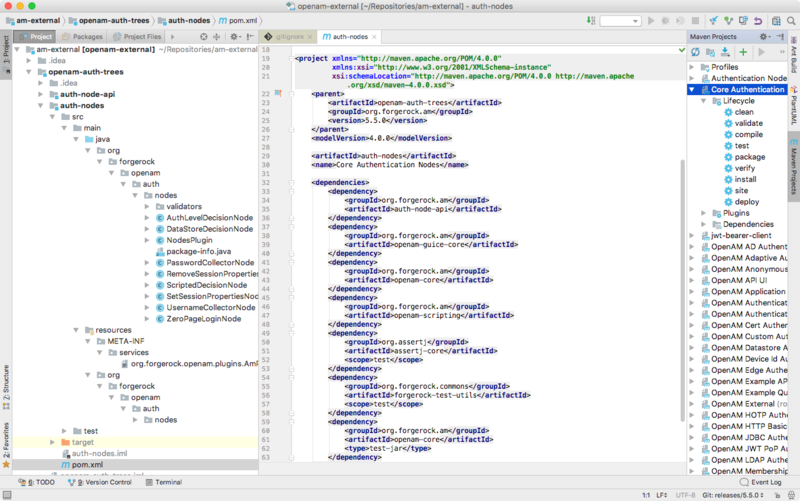 The class is annotated with org.forgerock.openam.auth.node.api.Node.Metadata. The annotation has two main attributes - configClass and outcomeProvider. Typically, the configClass attribute is an inner interface in the node implementation class. For simple use cases, the abstract implementations of the node interface, org.forgerock.openam.auth.node.api.SingleOutcomeNode and org.forgerock.openam.auth.node.api.AbstractDecisionNode, have their own outcome providers that can be used. For more complex use cases you can provide your own implementation. The annotation specifies the outcome provider and configuration class. The outcome provider can use the default SingleOutcomeNode or MultipleOutcomeNode, or a custom OutcomeProvider can be created and referenced from the annotation. See the Choice Collector Node for an example of a custom outcome provider. The config interface defines the configuration data for a node. A node cannot have state, but it can have configuration data. Note that you do not need to provide the implementation class for the Config interface you define. AM will create these automatically, as required. An example is the Account lockout Node. The node can be configured to lock or unlock the users' account, based on it’s configuration. Configuration is per-node. Different nodes of the same type in the same tree have their own configuration. //This will default to the value LOCK. The @Attribute annotation is required. It can be configured with an order value, which determines the position of the attribute in the UI, and with validators, to validate the values being set. In the example above, a custom enum called LockStatus is returned. The options are displayed to the user automatically. Dependencies should be injected by using Guice as this makes it easier to unit test your node. For example, you should accept the config as a parameter. You may also wish to obtain AM core classes, such as CoreWrapper, instances of third-party dependencies, or your own types. The process method takes a TreeContext parameter, does some processing, and returns an Action object. An action encapsulates changes to state and flow control. The TreeContext parameter is used to access the request, callbacks, shared state and other input. The process method is where state is retrieved and stored. The returning Action can be a response of callback to the user, an update of state, or a choice of outcome. The choice of outcome in a simple decision node would be true or false, resulting in the authentication tree flow moving from the current node to a node at the relevant connection. * specific language governing permission and limitations under the License. * information: "Portions copyright [year] [name of copyright owner]". * Copyright 2017-2018 ForgeRock AS. * A node which contributes a configurable set of properties to be added to the user's session, if/when it is created. * Configuration for the node. * A map of property name to value. * @return a map of properties. * Constructs a new SetSessionPropertiesNode instance. * @param config Node configuration. The @Node.Metadata annotation. See "The Meta Data Annotation". Implementing the Node interface. See "The Node Interface". Implementing the Config interface. See "The Config Interface". Injecting the Node instance. See "Injecting Objects Into a Node Instance". Creating an Action instance. See "The Action Interface". The annotation specifies the outcome provider and config class, and optional config validator class. The class name that the node uses to set up the possible outcomes. The SingleOutcomeNode and AbstractDecisionNode base classes provide suitable outcome provider classes for those node types. You can create a custom outcome provider for other circumstances. * Defines the possible outcomes from this Ldap node. The class name that contains the configuration of any attributes requested by the node when using it as part of a tree. For more information, See "The Config Interface". An optional class name used to validate the provided configuration. For more information on the @Node.Metadata annotation, see the Node.Metadata annotation type in the AM 6.5.1 Public API Javadoc. The code for an authentication node must implement the Node interface. Used in nodes that only have a single exit path. The Modify Auth Level Node is an example of a node that uses the SingleOutcomeNode base class. For more information, see the SingleOutcomeNode class in the AM 6.5.1 Public API Javadoc. Used in nodes that have a boolean-type exit path, for example true or false, yes or no, or allow or deny. The Data Store Decision Node is an example of a node that uses the AbstractDecisionNode base class. For more information, see the AbstractDecisionNode class in the AM 6.5.1 Public API Javadoc. Implement the Node interface yourself if your custom node exit paths do not match the scenarios outlined above. For more information, see the Node interface in the AM 6.5.1 Public API Javadoc. The Config interface of a node contains the configuration values required by a particular node instance. Note that you do not need to write a class that implements the interface you define, AM will create it automatically, as required. Define the properties the node will use in the Config interface, by using the @Attribute annotation. The @Attribute annotation specifies the order of the properties in the tree designer view as well as providing a way to specify additional validators. The domain attribute is a string-typed value which can be provided in the tree designer view by the tree administrator. It can be read in the process method by using a reference to the config interface, for example config.domain(). A boolean attribute with an additional parameter, validators, containing a reference to a validation class. In this case, a value is required to be provided by the tree administrator. A custom enum attribute. This provides type safety and negates the misuse of Strings as generic type-unsafe value holders. The UI will correctly handle the enum and only let the tree administrator chose from the defined enum values. Note that attribute names are used when localizing the node's text, see "Internationalization". For more information, see the Config annotation type and the Attribute annotation type in the AM 6.5.1 Public API Javadoc. You can share configuration between nodes that have common properties. For example, a number of your nodes may call out to an external service that requires a username, password, IP address, and port setting. Rather than repeat the same configuration in each of these nodes, you can create a shared, auxiliary service to hold the common properties in one of your nodes, and reference that service from multiple other nodes. The following sections explain how to create this auxiliary service and reference it in your nodes. Also covered is how to run more than one instance of an auxiliary service if required, and how to obtain the configuration from services built-in to AM. You can create a shared auxiliary service in the configuration interface defined as part of a node. Annotate the service with the org.forgerock.openam.annotations.sm.Config annotation to describe how the service functions. You can also specify other features of the service, such as whether the service is a singleton in its scope, or if it can have multiple instances. For information about supporting multiple instances, see "Allowing Multiple Instances of an Auxiliary Service". To access the shared auxiliary service, add org.forgerock.openam.sm.AnnotatedServiceRegistry to the @Inject-annotated constructor of the node. To enable configuration of multiple instances of the auxiliary service in either the same realm or at a global level, set the collection attribute to true in the Config annotation. You can present the names of the instances of the service as a drop-down menu to the tree administrator. You can obtain configuration from services built-in to AM. For example, you might want to access the Email Service configuration to obtain the SMTP settings for the realm. Most services are defined by using an annotated interface. Legacy services that are defined by using an XML file. See the following sections for information on obtaining the configuration from services defined with either of the two methods. Obtain an instance of the service using one of the get methods of AnnotatedServiceRegistry in the constructor. To obtain an instance of the configuration from a legacy service, use the APIs in the com.sun.identity.sm package. A node instance is constructed every time that node is reached in a tree, and is discarded as soon as it has been used to process the state once. This model is different to authentication modules, which are instantiated once for each end-user authentication process, and then all authentication interactions for the life of the authentication process address the same instance in the same JVM. Modules can store state in the module instance. However, state stored in a node will be lost when the node's process method is complete. To make state available for other nodes in the tree, nodes must either return the state to the user or store it in the shared state. AM uses Google's Guice dependency injection framework for authentication nodes. AM uses Guice to manage most of its object life-cycles. You can use just-in-time bindings from the constructor to inject an object from Guice. The realm that the node is in. The unique ID of the node instance. The tree that this node is being processed as part of. The configuration object that is an instance of the interface specified in the configClass metadata parameter. Any other objects in AM that are managed by Guice can also be obtained from within the constructor. For more information, see the Inject annotation type and the Assisted annotation type in the Google Guice Javadoc. The MyCustomModule object will then be automatically configured as part of the injector creation. The Action interface encapsulates changes to authentication tree state and flow control. A list of the callbacks that have been requested by the node. This list may be null. The result of the node. A map of properties that will be added to the final session if the authentication tree completes successfully. Use the putSessionProperty(String key, String value) and removeSessionProperty(String key) methods to add or remove entries from the map. A JSON representation of the shared state - the properties set so far by nodes in the tree. See "Storing Values in Shared Tree State". A JSON representation of any transient state - properties with security or secret values set by previous nodes in the tree. Transient tree state is not persisted to the authentication session, and is only available until the authentication flow reaches the next node requiring user interaction. Specify the exit path to take, and move on to the next node in the tree. See the goTo method in the AM 6.5.1 Public API Javadoc. Send the specified callbacks to the user for them to interact with. See the send methods in the AM 6.5.1 Public API Javadoc. Returns true if the action is a request for input from the user. See the sendingCallbacks method in the AM 6.5.1 Public API Javadoc. For more information, see the Action class in the AM 6.5.1 Public API Javadoc. Tree state exists for the lifetime of the authentication session. Once tree execution is complete, the authentication session is terminated and a user session is created. The purpose of tree state is to hold state between the nodes. A good example is the Username Collector Node, which gets the user name from the user and stores it the shared tree state. Later, the Data Store Decision Node can pull this value from shared tree state and use it to authenticate the user. Authentication sessions when using chains and modules are stateful - the AM server that starts the authentication flow must not change. A load balancer cookie is set on the responses to the user to ensure the same AM server is used. In contrast, authentication trees can be made stateless, so that any AM instance in a deployment can continue the authentication session. For more information on configuring sessions, see "Implementing Sessions" in the Authentication and Single Sign-On Guide. To store a value in shared tree state, create a copy of the existing tree state, insert the new value into the copy, and then replace the existing state with the copy before returning the Action from the process method. Authentication state should always be stored in the TreeContext sharedState object, which is then passed in as a parameter to the process method. AM ensures that this shared state is made available to downstream nodes. To avoid storing sensitive information, such as passwords, a distinction is made between authentication state which can be written to CTS or to a JWT, and state which should only be available for the duration of the current HTTP request. Sensitive information, such as passwords, should be stored in the TreeContext transientState. AM allows a node to read and write data to and from an identity's profile. This is useful if a node needs to store information more permanently than when using either the authentication trees' sharedState, or the identity's session. Any node which reads or writes to an identity's profile must only occur in a tree after the identity has been verified. For example, as the final step in a tree, or directly after a Data Store Decision Node. Wrap the method call in an instantiable class to ease testing. If AM is configured to search for the identity's profile using a different search attribute to the default, provide the attributes as a third argument to the method. To obtain the attributes you could request them in the configuration of the node, or obtain them from the realm's authentication service configuration. By combining these approaches, you can search for an identity by using the ID and whichever configured attribute field(s) as neccessary. To read individual specific attribute values from a profile, after obtaining the profile, use the AMIdentity#getAttribute(String name) method. Callbacks are the method that nodes use to obtain interaction with the authenticating user. Calling the getCallbacks() method on a TreeContext - the sole argument to the process() method of a node - returns a list of all the callbacks that have just been displayed in the UI. Callbacks must implement the javax.security.auth.callback.Callback interface, although there are already many convenient existing implementations in the package and you may not need to create your own. In order to process responses to callbacks, it is necessary to know which callback is at which position in the list. You can find the position of the callbacks created by the current node by using the constant properties for each callback position in the processing node. If the callbacks were created in previous nodes, their positions must be stored in the shared state before subsequent nodes can use them. Note that the order of callbacks defined in code is preserved in the UI. Variables can be injected using your favourite Java String utilities, such as String.format(script, myValue). Authentication flow can return to the same decision node by using two different methods. The first method is to route the failure outcome through a Retry Limit Decision Node. This node can limit how many times a user can enter incorrect authentication details. In these instances, the user is returned to re-enter their information, for example back to an earlier Username Collector Node. A typical example of returning to the same node is a password change screen where the user must enter their current password, new password, and new password confirmation. The node that processes these callbacks needs to remain on the screen and display an error message if any of the data entered by the user is incorrect. For example, if the new password and password confirmation do not match. When a ConfirmationCallback is invoked on a screen that was produced by Action.send(), it will always route back to the node that created it. Once the details are valid, return an Action created using Action.goTo() and tree processing can continue as normal. This section covers error handling in authentication nodes, including how to report errors to end users and tree administrators, as well as handling unrecoverable errors. When errors occur during node processing, for example an LDAP server connection is down, throw a NodeProcessException exception, with the desired message. You can display error messages to the tree administrator, for example when a configuration property of a node is required but not provided. To control the messages displayed on error, ensure there is a .properties file under src/main/resources/org.forgerock.openam.auth.nodes with the same name as your node class. For more information, see"Internationalization". The plugin class is responsible for informing AM about the details of the customized authentication node. There is little variation between the plugin class for each authentication node, other than the version number and class names within. Authentication nodes are installed into the product using the AM plugin framework. All AM plugins are created by implementing org.forgerock.openam.plugins.AmPlugin interface and then registering it using the Java service architecture - placing a file in META-INF/services. For plugins that provide authentication nodes there is an abstract implementation of the AmPlugin interface named org.forgerock.openam.auth.node.api.AbstractNodeAmPlugin. Name the plugin class after the core class, and append Plugin, for example MyCustomNodePlugin. Provide a version number for the authentication node. Ensure a call to the getNodesByVersion() function returns the core classes of the authentication nodes to register. In this example the version is 1.0.0, and there is just one node being registered as that version. The plugin has been found during AM startup, and is being installed for the first time. It should create all the services and objects it needs. The plugin is installed and is being started. Any dependency plugins can be relied on as having been started. FIRST_TIME_INSTALL. The AM instance has been installed for the first time. FIRST_TIME_DEMO_INSTALL. The AM deployment has been installed for the first time, using an embedded data store as the config and user stores. NORMAL_STARTUP. The AM instance is starting from a previously installed state, or is joining an already installed cluster. The AM instance is in the process of shutting down cleanly. Any resources the plugin is using should be released and cleaned up. An existing version of the plugin is installed, and a new version has been found during startup. The plugin should make any changes it needs to the services and objects used in the previous version, and create all the services and objects required by the new version. The version of the plugin being upgraded is provided. An AM system upgrade is in progress. Any updates needed to accommodate the AM upgrade should be made. Plugin-specific upgrade should not be made here, as upgrade will be called subsequently if the plugin version has also changed. The AM version being upgraded from, and to, are provided. The plugin is responsible for maintaining a version number for its content, which is used for triggering appropriate events for installation and upgrade. For more information, see amPlugin in the AM 6.5.1 Public API Javadoc. Over time, it may become necessary to change the schema of the configuration for your node. In the development stage, give your nodes the special version number 0.0.0. Any AM configuration created by nodes that have this special version number is wiped on each restart of AM. Any instances of nodes with version 0.0.0 that are used within trees will need to be removed and re-inserted into the affected trees, so that the updated schema is applied and available to those tree. After moving to production and switching to semantic versioning, you must write upgrade functions into the node to locate existing configuration and convert it to the new schema. For information on upgrading schema in production mode, see "Upgrading Simple Node Configuration Schema Changes" and "Upgrading Complex Node Configuration Schema Changes". This section explains how to upgrade nodes with simple schema changes, for example changing an attribute to a compatible type. Changing the type of an attribute to one that is backwards-compatible with any existing values. For example changing an integer to a string type, or T to Set<T>. This section explains how to upgrade nodes that are changing the configuration schema such that existing values would clash with the new schema, for example changing an attribute to an incompatible type. When configuration schema changes are complex, use the API provided in the com.sun.identity.sm package, as detailed below. Version 2.0.0 of the node requires the user's given name and family name separately, rather than simply a name string. To upgrade this example node configuration, find all existing instances of configuration created by the version 1.0.0 node, find the current values for the name attribute, and split it on the first space character to use in the two new attributes. Internationalization (i18n) of content targets both the end user and the node administrator. Messages sent to users and other UI can be internationalized. Additionally, error messages and administrator-facing UI can be internationalized using the same mechanism for better operator experience. Internationalized nodes use the locale of the request to find the correct resource bundle, with a default fallback if none is found. 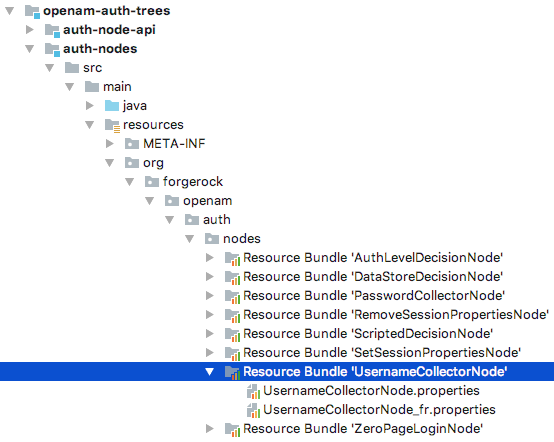 Create a Java resource bundle under the resources folder in the Maven project for your node. The path and filename must match that of the core class that will use the translated text. Create a .properties file in the resource bundle for each language your node will display. The filename must include the language identifier, as per rfc5646 - Tags for Identifying Languages. For example, for French translations your .properties file could be called UsernameCollectorNode_fr.properties. This section explains how to build and install authentication nodes for use in authentication trees. Run the mvn clean package command. The project will generate a .jar file containing your custom nodes. For example, auth-nodes-6.5.1.jar. Delete or overwrite older versions of the nodes .jar file from the WEB-INF/lib/ folder, to avoid clashes. Restart AM for the new nodes to become available. 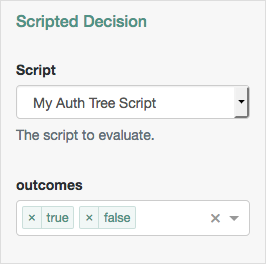 For more information on using the tree designer to manage authentication trees, see "Configuring Authentication Trees" in the Authentication and Single Sign-On Guide. For information on upgrading custom nodes, see "Upgrading Nodes and Configuration Changes". This chapter covers post-installation tasks relating to authentication nodes, such as testing, debugging, auditing, and performance monitoring. You can test authentication nodes in numerous ways. For example, you can use unit tests, functional tests, and perform exploratory or manual testing. Authentication nodes are well suited to tests which have a high percentage of code coverage. The low amount of static dependencies mean that unit testing of the node class itself can occur, rather than simply the business logic classes, as was the case for modules. Furthermore, as nodes should be significantly smaller than modules, testing iterations should be much shorter. Your unit tests should aim for an appropriately high level percentage of coverage of the code. Unit testing becomes easier with nodes, as most of the business logic is defined by the tree layout, rather than in the nodes themselves. At minimum, the process(TreeContext context) method should be tested to ensure that all appropriate code paths are triggered based on the existence, or lack of, appropriate values in the shared state and callbacks. The TreeContext class and contents have been designed to make sure they are simple to use in unit tests, without the need to resort to mocking. Functional tests involve deploying the node into an AM instance and testing it using the authentication REST API. They should be written to cover all normal flows through the node. All the appropriate code paths discovered through unit testing should be functionally tested to ensure that helper, utility, and related mechanisms function as expected. Additionally, functional tests will ensure that the business logic is correctly called and processed as expected. Mocking expected services may be useful when functionally testing nodes that call out to third-party services. Manual testing should occur both during and after node development. During development, it is expected a node developer will frequently load and reload nodes to ensure they operate as expected, including configuration and execution, as well as any expected error conditions. After development, manual testing should continue in an exploratory fashion. Simply using a node numerous times can often highlight areas left unpolished, or particular usability issues that may be missed by automated testing. Add debug logging to your custom node to help administrators and support staff investigate any issues which may arise in production. To add debug logging to a node, obtain a reference to the amAuth SLF4J Logger instance. Consider the logging level you use - over use of the error or warning level can cause debug logs to fill, and even affect performance if your node is used frequently. You can also use the SLF4J varargs methods to defer string concatenation to SLF4J. This means string concatenation can be skipped if the configured logging level means that your message will not be written. Audit logging helps administrators to investigate user and system behavior. AM records all incoming calls as access events. Additionally, in order to capture further details regarding authentication flows, AM records an authentication audit event for each node, and the tree outcome. A node can provide extra data to be included in the standard audit event which is logged when an authentication node completes. AM logs an AM-NODE-LOGIN-COMPLETED audit event each time an authentication node completes. To add extra information to this audit event, override the node interface method getAuditEntryDetail. The result of the getAuditEntryDetail method is stored in the nodeExtraLogging field. You can track authentication flows which complete with success, failure, or timeout as an outcome by using the metrics functionality built-in to AM. For more information, see "Monitoring Services" in the Setup and Maintenance Guide. This chapter offers solutions to issues that may occur when developing authentication nodes. How do I get new attributes to appear in the node after the service has been loaded once? See "Upgrading Nodes and Configuration Changes". What type of exception should I throw so that the framework handles it gracefully? To display a custom message to the user, exceptions must be handled inside the node and an appropriate information callback returned. For more information, see "Handling Errors". Do I need multiple projects/jars for multiple nodes? No - you can bundle multiple nodes into one plugin, which should be deployed in one single .jar file. What ForgeRock utilities exist for me to use to assist in the node building experience? A number of utilities are available for use in your integrations and custom nodes. See the AM 6.5.1 Public API Javadoc. Transient State vs Shared State - When should I use one or the other? Transient state is used for secret values that should not persist. See "Storing Values in Shared Tree State". If my service collects a username in a different way from the Username Collector Node, where do I put the username from the framework to get the principal? See "Accessing an Identity's Profile". Where do I go for examples of authentication nodes? There are many public examples of ForgeRock community nodes at https://github.com/ForgeRock. Examples of community nodes written by third parties may be found on the ForgeRock Marketplace. For source access to the authentication nodes builtin to AM, see How do I access and build the sample code provided for AM/OpenAM (All versions)? in the ForgeRock Knowledge Base. Copyright © 2018-2019 ForgeRock AS.